Octavian and Divus Julius Caesar. 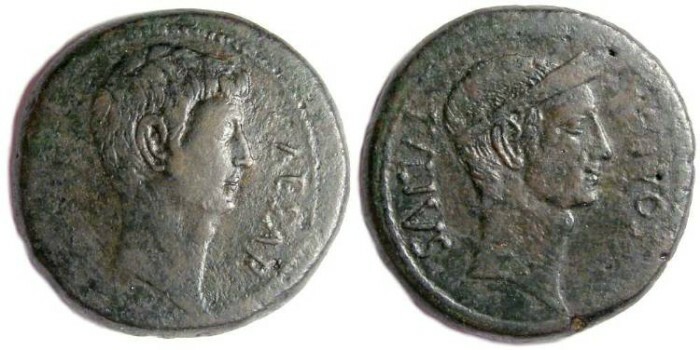 AE sestertius or Dupondius. ca. 31 BC. Denomination : Bronze sestertius or Dupondius (it is not know which denomination these in tended to be, but the size is consistent with a sestertius). Mint : Uncertain South Italian mint. Date : issued from 38 BC. Reference : Sear-1569. RPC I 620. Size : 30.3 x 31.5 mm. Weight : 17.80 grams. Grade : gVF/VF with a very dark green (nearly black) patination, however some parts of the inscriptions did not strike up. Obverse : Head of Octavian right, with CAESAR DIVI F around (the last part of the inscription did not strike up). Reverse : Head of Julius Caesar right, with DIVOS IVLIVS around.